Control Solutions' Babel Buster Pro V230 is a hardware device - a network gateway - that provides several SNMP functions, including Trap Receiver. 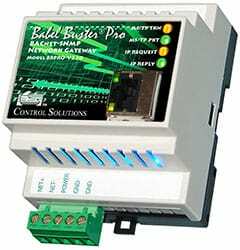 The Babel Buster Pro V230 trap receiver has the ability to turn traps into BACnet object values and has the ability to automatically take further action based on the trap. Taking action with physical results is a common requirement that is not met by many software products called "trap receivers". The Babel Buster Pro V230 has the ability to take action. Simple responses can be created just using rule templates in the Babel Buster Pro V230. More complex actions can be created by writing your own program using the Script Basic built into each Babel Buster Pro. The actions taken in response to SNMP traps result in data being placed in BACnet objects. This data can be shared with other BACnet devices, such as a building automation controller. 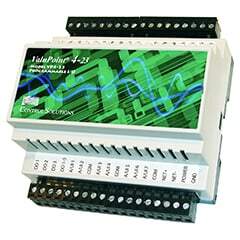 The ValuPoint VP4-2330 shown here is one example of an economical BACnet I/O device that can be used to switch something on or off in response to SNMP traps. The Babel Buster Pro V230 gateway will translate traps into BACnet objects. A BACnet based BMS can then read the objects in the gateway, or subscribe to their COV notifications. The gateway also has the ability to be BACnet client, writing data to objects in other devices. Whether your Pro V230 is operating as a server or a client, you now have total flexilibity in receiving SNMP trap information on the BACnet network. Follow the link below to read more about the Babel Buster Pro V230. You will find detailed information, including data sheet, User Guide and introductory videos.